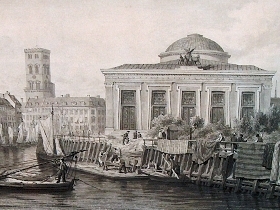 Thorvaldsens Museum from 1848 is situated beside Christiansborg Palace. During a whole lifetime the great Danish sculptor Bertel Thorvaldsen (1770-1844) - had created more than 550 sculptures - reliefs and portrait busts - and had donated his impressive art collection to the Danish people in 1830. After spending nearly 40 years in Rome - Thorvaldsen left for Copenhagen in 1838 strongly determined to build a museum in his native city for all of his original models and extensive collections of contemporary paintings and ancient artefacts. 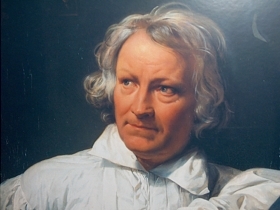 Portrait of Sculptor Bertel Thorvaldsen painted by Horace Vernet in 1835. Thorvaldsen was an outstanding representative of the Neoclassical period in sculpture. Photo from 1856 of Thorvaldsens Museum near Frederiksholms canal - with Nikolaj Church in the back - and without its present spire. 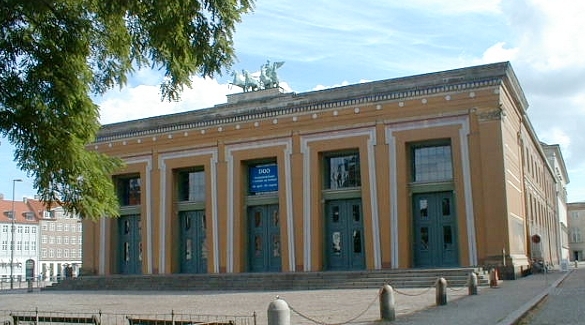 The museum was inaugurated in 1848. The Thorvaldsens Museum was built between 1839 and 1848 - and on 18 September 1848 - Thorvaldsens Museum opened as the first museum building in Denmark for the public - showing most of the monumental works of this great Danish sculptor. 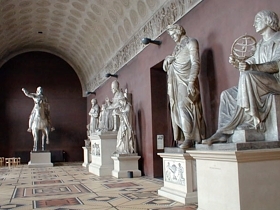 Unfortunately – Thorvaldsen did not experience the opening of his museum - as this happened four years after his death. The Thorvaldsen Museum is today one of the most visited sites in Copenhagen with an outstanding collection of his sculptures and Danish art from the Golden Age 1800-1850. 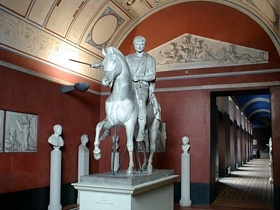 Equestrian statue of the royal war hero Józef Poniatowski - who was a Polish leader that became Marshal of France - exhibited at Thorvaldsens Museum. 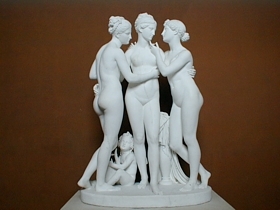 Famous sculpture by Thorvaldsen of the 3 Graces and Cupid from 1821 - also called the three goddesses of joy - charm and beauty displayed at Thorvaldsens Museum. Thorvaldsens Museum was established as a complete rebuilding of the old Royal Coach House - which was placed where the Museum now stands close to Christiansborg Palace in the centre of Copenhagen. The Museum was inside provided with two floors and a basement with a series of small rooms - where each individual sculpture was placed - so the visitors in peace could enjoy the art collection. The Great Hall with a exact copy of Pope Pius VII’s sepulchral monument erected in pure marble in Saint Peter's Basilica in the Vatican City of Rome. 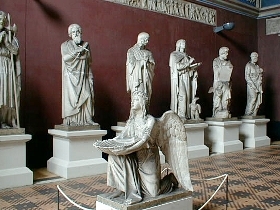 Models of the sculptures of Apostles and baptismal font similar to the ones in marble placed in the Cathedral of Our Lady in Copenhagen. When he visited Denmark in 1819, he was commissioned to make a massive series of statues of Christ and the 12 Apostles as well as a baptismal font of Italian marble in connection with the decoration of the interior of “Vor Frue Kirke” (Copenhagen Cathedral - The Church of Our Lady) during the rebuilding of the Cathedral from 1817 until the Cathedral was completed in 1829. The font and the rest of the marble works were produced in Rome and were not finished until 1838. 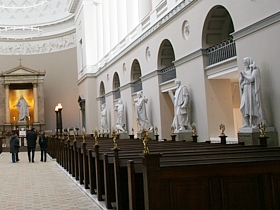 The decoration of the Church was Bertel Thorvaldsen's personal gift to Copenhagen Cathedral. The large monumental models of the sculptures of Christ and The Twelve Apostles as well as the baptismal font are placed in the Christ Hall at the museum. 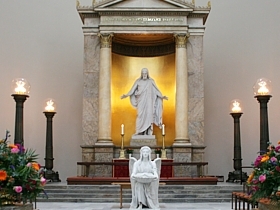 The Altar figure of Christ and the baptismal font - shaped like a guardian angel - of pure Italian marble at Copenhagen's Cathedral by Thorvaldsen. The twelve apostles by Thorvaldsen are placed in the nave of Copenhagen's Cathedraland - and each statue represents a symbol that is associated with each apostle. Thorvaldsen also received a special commission doing him great honour when he was invited to create a sepulchral monument in pure Italian marble of Pope Pius VII (1742-1823) to be erected in the Basilica of St Peter’s Cathedral in Rome. The work of the monument was accomplished between 1823 and 1831. 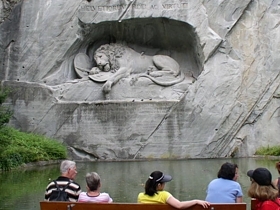 Another remarkable assignment and project was the famous carving of a dying lion out of the natural rock in 1819 - called "Lion of Lucerne" (Löwendenkmal) - and located in a small park just off Lowenplatz – Lucerne - Switzerland. The monument carved in the rock portrays a dying lion lying across the broken symbols of the French monarchy and commemorates the hundreds of Swiss Guards who were massacred in 1792 during the French Revolution. 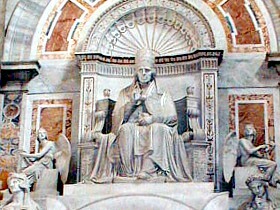 The sepulchral monument in pure Italian marble of Pope Pius VII by Thorvaldsen - placed in Saint Peter's Basilica in the Vatican City of Rome. The "Lion of Lucerne" from 1819 by Thorvaldsen - commemorates the Swiss Guards who were massacred in 1792 during the French Revolution. Bertel Thorvaldsen was born in Copenhagen on 19 November 1770 and died in Copenhagen on 24 March 1844. His funeral took place in the Cathedral Church of Our Lady in 1844 - and he was finally buried in the inner courtyard of Thorvaldsens Museum in September 1848. 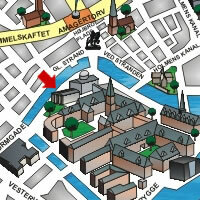 The museum offers guided tours in English every Sunday at 15.00 in July and August. Free, though with entrance charge to the Museum. The tours provide a general introduction to Thorvaldsens Museum and Thorvaldsen’s works. Thorvaldsens Museum is centrally located – just beside Christiansborg Palace and Christiansborg Chapel - The National Museum and few blocks from The Glyptotek and the Central Station. To be continued and updated!